If I were a jewelry wearer, I would wear something like this. 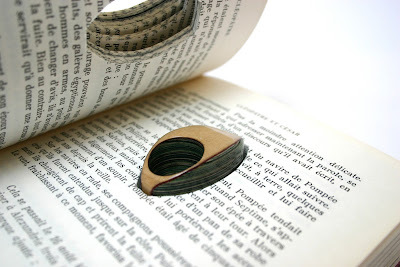 Imagine taking a copy of your favorite book and turning into a wearable piece of art. I think that's pretty cool. Gaudy, yes, but still cool. You know, maybe I'll get my nose pierced so I can put one of those big bone-like things through it, but it'll actually be from a copy of "Cyrano de Bergerac." Oh, the amusing irony! Paper is many things: a carrier of text, illustration, history and emotion. Jeremy May has captured the beauty of paper via a unique laminating process. Littlefly jewellery is made by laminating hundreds sheets of paper together, then carefully finishing to a high gloss. The paper is selected and carefully removed from a book, and the jewellery re-inserted in the excavated space. Check them out at Littlefly.